Who Raised More From Out of State? A Campaign Commercial, But Whose? Barrios to Drop Out of DA's Race? Christy, if you really want to steal her thunder next week, just cut the price of regular unleaded gas at your convenience stores to $1.99 a gallon. Every TV camera in the state would be on the Cape. [Christy Mihos] also invited the teachers to visit his Christy's convenience store in Hyannis, where he said he personally would be pumping gas at the deeply discounted price of $1.97 per gallon. Not sure who attracted the most cameras, but I hope Carr got his consulting fee. As those of you who read Blue Mass. Group already know, BlogLeft -- a loosely affiliated group of Massachusetts progressive blogs -- the Lowell Democratic City Committee (LDCC) and the Greater Lowell Area Democrats (GLAD) are co-sponsoring a Lt. Governors Forum at the Lowell Senior Center on Sunday, May 21 at 2:00 PM. The format for this event has not yet been officially finalized, but the idea is to have a debate, with all candidates answering questions asked by a moderator of some kind. All four Lieutenant Governor candidates are now confirmed to be there. The Lowell Dems have more details and David from BMG is soliciting questions. I've been told that the Senior Center has wireless Internet, so the whole event will be liveblogged. More details on that as they come available. Both events are free and open to the public. They're also both before the Democratic convention in Worcester, so they make a perfect opportunity for delegates to grill the candidates before the endorsement vote. Yesterday, the House Commerce Committee voted on the "Communications Opportunity, Promotion and Enhancement Act of 2006" (COPE Act) which would overhaul the 1996 Telecommunications Act. Congressman Ed Markey (D-Malden) proposed an amendment to the act that would preserve Net Neutrality. You can hear Markey's statement introducing the amendment on his website. The SavetheInternet.com coalition collected a quarter million signatures in support of the Markey amendment, but it was voted down 34-22. Four Democrats voted against the Amendment, and one Republican -- Heather Wilson (R-NM) -- voted in favor. The good news is that some of the Congressmen who voted the amendment down in subcommittee changed their votes in the full committee. We can make a difference in this fight. If you haven't called your Congressman yet, do it now. Can somebody tell me what this elephant is supposed to be doing to the Lowell Convention Center? So far in 2006, Romney is spending almost half his business days outside Massachusetts, most frequently fostering his own presidential ambitions or boosting the Republican Governors Association, of which he is serving as chairman this year. In the first four months, he was gone all or part of 56 days, including 38 during the work week. Last week, he was gone four out of five business days. In Romney's defense, his Spokesman Eric Fehrnstrom makes the case that the Governor's travel is no different than what former Governor Mike Dukakis did during his time as chair of the Democratic Governors Association. That's as may be, but Fehrnstrom should be careful what he says if he wants to follow his boss to Washington. I can just see the Republican Primary commercials now: "Romney: No different than Dukakis". That'll win them over in South Carolina! "You're not going to recruit candidates unless Republicans win," he said. "Candidates aren't going to run for office to throw themselves against a wall. They have to see Republicans winning. We haven't won enough elections." Republicans can't recruit candidates for office in Massachusetts because they can't find a way to win in Massachusetts. In a related story, Romney was asked why Massachusetts keeps losing jobs: "Massachusetts is losing jobs because fewer companies are hiring people in the Commonwealth," Romney said. "In addition, Massachusetts is losing population because more people are leaving the state than settling in it. Also, 2005 MCAS scores were down because students didn't do as well on the MCAS tests," he added, helpfully. Edward Moscovitch, president of Cape Ann Economics, has an editorial in today's Boston Herald. Moscovitch echos calls for property tax relief instead of income tax cuts. Gubernatorial candidates Kerry Healey and Tom Reilly used last week's tax deadline to renew their calls for cutting the state income tax from 5.3 percent to 5 percent - at an eventual cost of about $750 million a year. Given the uncertainties associated with the new health care bill and the cuts made in recent years to state colleges, social services and environmental programs, it's not at all clear the state could afford such a cut. But even if there is extra money, it would be far better to cut local property taxes by raising state aid. Property taxes, after all, are not based on ability to pay, while the income tax is the fairest tax we have. Local governments across the state are in crisis. With skyrocketing health-care premiums, local aid well below what it was four years ago and Proposition 2 overrides hard to pass, cities and towns are closing firehouses, cutting back library hours, bringing on fewer police cadets and raising class sizes. At the end of the piece, Moscovitch asks if it's "naive to hope for a governor who levels with us about the choices we face and the true costs of cutting the state income tax?" I know at least one candidate who agrees with him. There's a fight brewing in Congress right now that affects all of us who provide content over the Internet and those of us who depend on that content. Telecommunications companies are trying to destroy the principle of "network neutrality" -- the idea that all network packets are created equal. The SavetheInternet.com Coalition launched their website this weekend and is making an effort to turn net neutrality from idea to law. The concept of network neutrality is explained in this two-minute video. The concept is simple -- supporters of net neutrality want all content that's sent over the Internet treated the same. Telecom companies are against this because they want to be able to sell access to the Internet above and beyond bandwidth charges and connection fees. They want to be able to charge extra for faster service, and to be allowed to choke off their competitors' products by slowing them down to the point where they're unusable. Put another way, if telecom companies are able to pick and choose who is able to connect to what services, they will effectively own the Internet and be able to dictate who uses it and for what. Matt Stoller over at MyDD has a great rundown this morning of the various players in the fight and the stakes we're facing. Our own Congressman Ed Markey (D-Malden) has been out front on this issue. His amendment to the telecom bill that would codify net neutrality was voted down earlier this month. Salon also had a featured article on net neutrality last week that is worth reading, even if you have to view an ad first. We can't let Congress give the Internet away to the telecommunications companies. It's too important to let Comcast, Verizon and AT&T dictate how we all can communicate with each other. Update: Dan Kennedy also has a detailed post on the threat to the Internet. I finally got a chance to sit down and watch the Democratic gubernatorial debate that aired this morning on Channel 4. For those night owls that missed it, it will be rebroadcast tonight at midnight. All in all, I think the candidates handled themselves well, and any one of them would be an improvement over the corner office's current occupant by a country mile. I think that despite some of the contentiousness, what you saw during that debate was more agreement than disagreement. All of the candidates want to grow the economy and all think that taxes are high, though each have different plans on how to reduce them: Chris Gabrieli says wait until we've replenished the rainy day fund, Deval Patrick says restore local aid to lower the property tax, and Tom Reilly says cut the income tax ASAP. There's a case to be made for all three, though personally, it's the property tax that I'm the most concerned about. In any case, I think Chris Gabrieli came off very well during the debate, but he did seem like a third wheel at times as Patrick and Reilly went back and forth. Gabrieli did manage to get off some good lines, and I did notice that the other candidates said "I agree with Chris" at least once each. I did bristle when Tom Reilly went off on a tangent questioning Deval Patrick's association with Ameriquest, but Patrick did a bit of political ju jitsu on the issue by discussing his role in correcting Ameriquest's predatory lending practices. The debate had some improvements over the usual format. In the interest of time, candidates did not give an opening statement, which I think was a good move. I've never thought that opening or closing statements added much. In addition, I liked the free time for rebuttal after answering where the candidates could actually interact. Too often, the rules of the debate are so restrictive that the candidates might as well just be giving parallel speeches, and there's no opportunity for the participants to talk to each other. Here's what I didn't like, though. The debate was taped on Friday and not aired until Sunday morning. That's fine, things are pre-taped in television all the time, but what was odd was that the press was invited to the taping, and they published articles before any member of the public had seen the debate. That meant that the Globe, CBS4, etc. could tell us what the debate was about before we were able to find out for ourselves. I would much prefer that people be able to make up their own minds about the debate without having to live in a media blackout before it's shown. Check out the Boston Globe's profile on Blue Mass. Group in today's paper. The Globe goes through the origin story of Massachusetts' most popular progressive political blog, and also has a companion piece on one of their "differently-winged" counterparts. The highlight of the article, of course, is the sidebar listing other Massachusetts-based political blogs. Yours truly tops that list. Welcome to anyone who's stumbled upon my little slice of the Internet. I guess that almost makes up for the Globe releasing my credit card information. Dan Kennedy has a good summary of the State Ethics Commission's recent ruling on political speech in state-owned buildings. Here's the short version of the ruling from the Globe, which Dan quotes on his blog. [T]he commission had "tightened its rules on political activity by public officials, barring them from writing stump speeches, answering campaign questions, or holding news conferences on political topics inside the State House or other state office buildings." The whole issue was touched off when state Democrats lodged a complaint that Gov. Mitt Romney called a press conference from the statehouse to denounce then candidate John Kerry for picking Senator John Edwards as his running mate. That seems to be a reasonable complaint, but the ethics commission has gone even further saying that if even if Romney had called a press conference for something else, and was asked about his thoughts on Kerry's pick, he would have to refrain from commenting. That's just silly. I can understand the impulse to separate the official duties of an elected official from their campaigns. This is important to keep politicians from fundraising or doing other campaign related work on the public's dime. That said, this ruling by the ethics committee goes way beyond that, forbidding anyone from even answering questions about their campaign or holding conferences "on political topics" if they happen to be in their office. If this rule is enforced, it will have a chilling effect on speech in Massachusetts as public officials avoid even the most innocuous of questions because they're afraid someone on the other side of some issue or another will levy ethics charges against them. It's also not hard to imagine a situation where a politician uses this ruling as an excuse to duck questions being asked by a pesky reporter, claiming that they are forbidden from answering. Unfortunately good-government types, not just here but elsewhere too, tend to err on the side of more regulation, more restrictions, when it comes to campaigns and political finance. In this case, I'm not sure that makes sense. Isn't it better for open government if politicians are able to answer any question posed to them, even if they're using state resources to do so? Last year, in one of my first blog posts ever, I created a map showing the results of the 2002 election by county. I colored it so that each county was a shade of purple that corresponded with the gubernatorial vote percentages in that county. A county that went for Shannon O'Brien (the Democrat) would be more blue, and a county that went for Mitt Romney (the Republican) would be more red. I had wanted to compare these results with those from 1998, but eventually I forgot about the project and moved on to other things. Over my vacation, I finally got a chance to put the map together. Here is the 1998 election map by county, in the style of the purple America map. 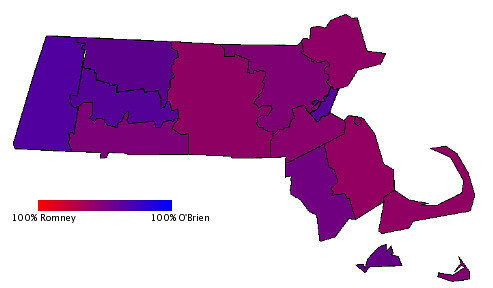 What this shows is that O'Brien got more votes than Harshbarger in every county except Barnstable. Romney did much worse than Cellucci did in Berkshire County, and lagged behind in Franklin and Hampshire counties as well. This data would suggest that while O'Brien did make gains on Harshbarger's run in 1998, she could not keep up with Republican gains in places like Middlesex, Essex, Norfolk and Worcester counties. How much of the increase in turn out can be explained by increased partisan voter registration during that time? By way of comparison, the number of registered Republicans increased by 9.17% from 1998 to 2002 while the number of registered Democrats increased by only 3.94%. That's a little misleading because there are so many more registered Democrats in Massachusetts than Republicans. Despite the difference in percentage gain, the Democrats actually registered over 10,000 more people than the GOP in those four years. That said, both parties increased their vote totals by more than increased voter registration explains. What can we take away from this? First is that, though Shannon O'Brien's percentage of the vote was lower than Scott Harshbarger's, she actually did better than he did in terms of vote totals. In fact, O'Brien actually would have beaten Paul Cellucci if you match her numbers from 2002 with his from 1998. That makes sense given the Democrats' higher turnout in '02, but you can really see how the increased Republican turnout effected the race. A greater percentage of Republicans turned out in 2002 than in 1998, and the Republican precentage change reflects that. The Dems are on the right track this year with their Victory 06 campaign. The winner in 2006 won't be the one who switches the most votes from the other party, but the one who's able to grow their vote total by bringing in people who are not regular voters. One plot summary for the 2006 gubernatorial campaign is that it's a race pitting Attorney General Tom Reilly against the millionaires: Chris Gabrieli, Lieutenant Governor Kerry Healey, Christy Mihos, and Deval Patrick. The underlying theme is that the politician standing closest to poverty is the purest. And since Reilly is the only one who rents his home, sends his children to public schools, and lives on a government salary (Healey returns hers to the state), he must be the one who can best sympathize with the little guy. It's appealing. But voters need to know more. The size of a candidate's bank account can reveal useful information. But measuring a candidate with a calculator can also generate stereotypes that obscure key issues. I find this very ironic coming from the paper that ran a whole story on Deval Patrick's house, followed it up with a story on how every candidate but Tom Reilly lives in a swanky pad, complains that the "millionaires" won't release their tax returns, and tells us exactly how many of them send their kids to expensive private schools. Now they're cautioning us that voters should be looking for a fuller picture of the candidates? The Globe has been the primary source of the "plot summary" of Tom Reilly vs. the Millionaires, and it seems to me that it's disingenuous for them to now tell us on the editorial page that none of that really matters while their news pages continue to frame the election that way. A little math, combined with your own graphic, shows that out-of-state contributors have given Thomas Reilly $630,000 and Deval Patrick $561,000. While it's true that a greater percentage of Patrick's funds have come from beyond Massachusetts' borders, in terms of actual dollar amounts, it seems that Tom Reilly has actually raised more from out of state. To be sure, I don't think that out-of-state money really matters. It is, unfortunately, often used as a scare tactic or to indicate that the recipient of those funds has no local support, or would be beholden to nebulous far away interests. Neither of these things are true for either Tom Reilly or Deval Patrick, and it would be nice if the Globe spent more time writing about what the candidates want to do once in office than how they plan to win. Do Massachusetts Hispanics Really Approve of Bush? Today, John Keller wondered why President Bush has a positive approval rating among Massachusetts Hispanics, at least according to the new CBS4/Survey USA poll. He posited a couple of reasons, such as his guest-worker immigration policy or his well-advertised faith. Personally, I'm not convinced. I think that Keller is reading way too much into a poll of 34 Massachusetts Hispanics. The 54% approve / 43% disapprove represents a difference of only four poll respondents. That sample size results in a margin of error of nearly 17% for that subgrouping. This means that if you ask this question of Hispanics twenty times, all but one of those surveys will have President Bush's approval rating somewhere between 37% and 71%. Looking at the tracking for the past year, it seems that this poll might even be an outlier. This is the highest rating the President has gotten in the past year among Massachusetts Hispanics, and the trend line is not at all smooth. Does anyone really think that anything has happened in the past month to cause a 40 point improvement for the President? That is just not plausible. I would not bother looking for reasons why President Bush had a positive approval rating among Hispanics this month and would instead ascribe it to an artifact of the small sample size until I saw more data. As of a few months ago, I had thought that the plan to build an LNG terminal in Fall River had been all but killed by the Coast Guard. At issue was the width of the Brightman Street Bridge, which spans the Taunton River. The Massachusetts Congressional delegation, particularly Congressman Jim McGovern (D-Worcester) had inserted language in the transportation bill that forbade the use of federal funds to demolish the bridge, all but ensuring that it would stay up. Weaver's Cove Energy, the group that wants to build the LNG facility, responded by saying it would just use narrower ships, small enough to fit through the bridge's 98 foot wide opening. The Coast Guard balked, however, saying that the proposed 82 foot wide vessels still left too little margin for error when navigating the bridge. Despite all this, the Federal Energy Regulatory Committee has reaffirmed their approval of the plan to build the facility. The regulators noted that the Coast Guard still has final say over the matter, and they are still reviewing the plan. In addition, project opponents have filed an appeal with the 1st US Circuit Court of Appeals to try to stop the project. Personally, I still can't see why it's such a great idea to build a new LNG facility in the far end of a medium sized city, 26 miles inland from the Atlantic Ocean. If Weaver's Cove is forced to use the smaller ships, they will end up doubling the traffic along the route, increasing not only the disruption of bridge traffic, but also the chances of an accident or sabotage. It doesn't make any sense to me, but it's consistent with the Bush Administration's energy policy, succinctly summed up by Congressman Barney Frank (D-Newton): "whatever any major energy company asks for, you give them." There were two bits of news that gave me hope for the Mass. Democratic Party's chances to retake the Governor's office. First, Under the Golden Dome reports that all three gubernatorial candidates will appear together at the state party's coordinated campaign kickoff. Personally, I think that sets a really good example. I want to see Tom Reilly, Chris Gabrieli and Deval Patrick united not only after the primary, but during it. I want them each to make the case for a Democratic governor first, and then tell us why they should be the candidate. In addition, the Boston Herald's Daily Briefing notes that Senator Kerry is helping the Mass. Dems raise $1 million for the eventual primary winner. Kerry has plenty of reasons to want to help the state Democrats take back the corner office. This is his chance to reconnect with the people who worked so hard for him in his Presidential campaign, particularly in places like New Hampshire. And don't forget that this is also payback for Romney and Healey's speeches at the 2004 Republican National Convention. The state Democrats are hoping that Senator Kerry will return the favor this fall. Okay, it was an accident, and it was Congressman Patrick Kennedy, not his father, Senator Ted. Still, it really did happen and Kennedy had to receive several stitches at Memorial Hospital in Pawtucket, RI. Kennedy later commented that it was still more pleasant than interacting with the late Gerald Solomon. CUT TO: Romney, at wooden desk on Faneuil Hall stage, signing bill into law. Politicians (including Senator Edward M. Kennedy) surrounding him erupt in applause. The packed hall cheers. Romney smiles. I wonder, though, who this is a campaign commercial for, exactly? I can imagine the same scene used in an ad for Senators Bill Frist or George Allen, or any other of Mitt's primary opponents in 2008. It almost writes itself -- "Governor Mitt Romney signed into law an anti-business socialized healthcare bill endorsed by Ted Kennedy and the liberal Massachusetts legislature." Sure, it's dishonest, but we've seen worse in GOP primaries, just ask John McCain. Romney can say he's a conservative all he wants, but after two decades of Massachusetts bashing, Republicans are going to naturally be skeptical, and they'll believe he's a liberal because it sounds 'truthy'. He must be liberal, after after all, to win an election in Kennedy-Kerry Country. I haven't talked much about the substance of the health care bill, soon to be the health care law, mostly because I have no idea how it's going to play out. Frankly, I'm a little worried about it's effect (or rather, non-effect) on skyrocketing health care costs. Supporters seem to do a little hand-waving here, saying that if everyone's insured, health care costs will go down because everyone's insured. Sure, I understand the theory, but I'll believe it when I see it. Reading some of the commentary, I'm reminded of what my mother used to tell me -- a compromise is when everyone walks away equally unhappy. With criticism coming from both the right and the left (see John McDonough's post today for two examples), maybe that means we have found a middle way for universal coverage. I just got back from a Deval Patrick event at Harvard. As usual, the Harvard Dems liveblogged his entire speech. Kudos to them, by the way for setting up not only this event, but several others that I managed to find my way into, despite being a number years removed from an undergraduate institution myself. The event was well attended, and most of the students there who identified themselves seemed to also be from Massachusetts. One of the things I've noticed in talking to Harvard students in the past is that they're not necessarily following the gubernatorial race here, but that was not the case at this forum. Patrick did what he usually does at these forums. He started out giving his bio and his stump speech, but keeps it short as possible so there's time for questions. If you've heard this before, it's essentially the same, though he has refined it in the past year and change. He talks of people who have checked out of politics because in part because they see the national GOP as too mean and the national Democrats as too vague. In addition he talks about his vision for Massachusetts which includes turning the state into an incubator for the renewable energy industry. In response to a question about the state income tax, Patrick again reiterated that he thought the rollback is fiscally irresponsible. We've already rolled back the income tax, and we've paid for it with rising property tax rates. If the goal is to give people back their money than the last rollback did not work. The cost of services continues to go up, and aid to cities and towns goes down. No one says they don't want local services -- things like roads, police, fire, etc -- so the property tax keeps skyrocketing. He calls this a 'fiscal shell game'. This, I think is one of the most important things he'll say, particularly because it makes him vulnerable to the 'Democrats will raise your taxes' claim in the general election. Patrick needs to be very clear in how he delivers this message, and I'm not sure he's there yet. I'd love it if he tied in the rising number of acrimonious prop 2 1/2 override fights. If people know that Patrick is focused on easing the property tax, I think he might get more leeway in his opposition to lowering the income tax. Patrick was also asked about his experience at Coke. He explained that he left Coke in protest after the CEO reneged on his promise to start an independent investigation into the anti-union violence at Coca-Cola bottling plants in Colombia. He also fielded questions on the health care bill, gang violence and immigration. Check the liveblog for more on those. As long as I'm on the subject, if there's anyone out there interested in helping collect signatures to get Deval on the ballot in the Watertown area on Saturday, please send me an email at watertownfordeval@gmail.com. I did a crude analysis of the results, and just subtracted the current numbers from the March poll and the news is even worse for the Attorney General. Despite the entry of Chris Gabrieli, Deval Patrick made statistically significant gains among 18 to 34 year olds (14 point swing), blacks (10 point swing), and those earning less than $80,000 per year (8 points for <$40K, 9 for $40-$80K). Tom Reilly polled the same or worse than March in across almost every demographic or ideological group. To be fair, Reilly did make gains among hispanics, but only six hispanics were counted in the poll, so that result is mostly meaningless. The only conclusion you can draw from this poll is that Gabrieli is taking more votes from Reilly than Patrick. This confirms what I've pretty much though all along. After all, the reason that Gabrieli entered the race in the first place was because a group of people were convinced that Reilly had damaged himself so much in January and early February that they needed to find someone else they thought had a chance to win. Now that Gabrieli is officially running, those people who were nervous about Reilly seemed to have jumped ship for the time being. The trends are bad for Reilly. He was consistently leading the three-man race last year when Secretary of the Commonwealth Bill Galvin was still in the running and Patrick was struggling in the single digits. What was a sure thing as recently as late January (before the St. Fleurasco) has now become a wide open race. Just a couple news items today I wanted to point out. The Berkshire Eagle has an article on the consultants being used in the gubernatorial race. Political consultants are kind of a mystery to me. I would love to have a crash course in who all these firms are and who's used them before. Today's Globe has a long profile on Sean Healey, husband to Lieutenant Governor Kerry Healey. The piece is pretty fluffy, and it's surprising that the Healeys refused to cooperate with the Globe for the article. One interesting tidbit: every time AMG stock goes up a buck, the Healeys make a million dollars on paper. Also, be sure to check out Blue Mass. Group's interview with Chris Gabrieli. The candidate sat down with BMG for about an hour and a half and talked about education, taxes, and the all-important question "why?" I'm not sure he answers that last one, but Charley's account of the interview is well worth reading. Expect the others to chime in shortly. On Thursday, I was invited to go to the Harvard Democrats Leadership Award Dinner by the Harvard Dems and former Virginia Governor Mark Warner's Forward Together PAC. Warner was receiving the Leadership Award, and would be the keynote speaker there. Not wanting to turn down a free dinner and a chance to see a potential 2008 presidential candidate, I gladly accepted. The evening was liveblogged by the Harvard Democrats, and another blogger I met there has already posted his thoughts. I thought Warner did pretty well. I don't think he struck any new ground in his speech, but I did like his style. When speaking, he seemed to find that middle ground that was neither too polished nor too stilted. For some reason I'm always surprised when a politician ends up sounding like a normal person. Maybe I should be more surprised when people who have been in politics their whole lives can't. Anyway, Governor Warner started off very strong, noting that the Democratic party can and must be competitive in every state in America. We do our party and country a disservice when we don't compete for every vote. I thought this was very encouraging; a ringing endorsement of the Democrats' 50 State Strategy, which is slowly but surely becoming conventional wisdom. How do we compete for every vote? Warner says it's by changing the debate. Don't talk about red vs. blue or liberal vs. conservative, but talk about the future vs. the past. Democrats do best when talking about the future. What's the next challenge we're going to face? I like that paradigm, and it reminded me of the saying I picked up somewhere: "Politics is like driving, D to go forward, R to go backward." It's too bad that Warner did not use this theme throughout his speech. While he did talk about the challenges we'll face in the near future, he did not do as great a job linking current policies to the past. That's one of my pet peeves about politicians. Rather than talk about how we need to change the debate, he should have used his speech to start changing the debate. Warner also spoke a lot about the American Dream, and how he was worried that it was becoming inaccessible to many, due in part to administration policies. America strives to be a place where everyone has a chance to succeed, and while we have not always lived up to that ideal, we usually move closer to it, rather than away from it. The fair shot for everyone is disappearing and if don't address this, past divisions will pale in comparison to what we'll face as people get left behind. Warner spoke of the danger of becoming a collection of gated communities with rural and inner city areas left out of the prosperity. He also resents the fact that the first thing the GOP did after 9/11 was to try to figure out how they could use it for political gain. He was in the middle of his campaign for governor at the time, and was only a few miles away from the Pentagon when it was hit. Even after 9/11 we still don't inspect our ports and do a terrible job in other areas of security. In Virginia, they stopped waiting for federal action and Warner made sure that first responders had an interoperable radio system so they could communicate in emergencies. He also talked about how real security comes from policies that unite our friends and divide our enemies, and not -- as the current administration has done -- the reverse. Warner identified a number of areas where we face challenges, but the most important was innovation. Intellectual capital has never been more important, and innovation is what we do best. Unfortunately, we are falling behind other countries in areas like research and development. To be successful, we need not only to invest in education, but also to be sure that we're attracting the best in the world. Luckily for you all, you don't have to rely on my notes alone. The Forward Together PAC gave me permission to post the full audio of the speech. The speech is just under forty minutes long and the sound quality is pretty poor due to the clinking glasses and my distance from the podium. If you are interested in listening, I'd appreciate it if you saved it on your own computer rather than running it off the server, to save my bandwidth. Overrides on the Rise: The Globe reported this that the number of Proposition 2 1/2 override attempts almost tripled between 2000 and 2005. Cities and towns are being starved of local aid, and that is putting a lot of pressure on their budgets. Without that extra money, the only tool in their toolbox is to raise property taxes. This is why talk of lowering the income tax doesn't make sense to me. It's the wrong tax! Let's handle the property tax crisis first before we potentially cripple the state's ability to help cities and towns. Globe: Gabrieli too Boring to be Gov: Yesterday's Boston Globe had this curious article in advance of Chris Gabrieli's announcement. I'm not sure why they felt they had to write a whole article which basically said "some people think Gabrieli is boring" rather than make this a sidebar in the article they knew they would be writing for today. It's almost as if they went out of their way to have a negative article about him on the day he made his run for governor. Anyhow, judge for yourself. Patrick Endorsed by DFA: Deval Patrick has been officially endorsed by Democracy for America. The endorsement sites how he "earned the support of DFA members across Massachusetts by empowering people to participate in his campaign and the democratic process" and could bring in donations from out of state, as well as publicity. In other Patrick related news, his campaign has upgraded their blog and is starting to fill it with audio and video content. The Phoenix's Adam Reilly is excited, and I think it has a lot of potential. Bloodsucking Vampire, Tom DeLay: I really liked this post from Whitescreek Journal. I'm not even sure how I came across it, but it's really well written and worth checking out. Good News for Fish: Mercury levels in fish from Massachusetts lakes and streams are down by as much as 32% in the seven years since tough regulations were put on local incinerators. This is great news because it really shows how changes in the law can really effect the environment, even in the short term. Not only that, but these results prove that local efforts can have a dramatic effect on the local environment, and we can make strides to clean up Massachusetts even if the Federal Government is not interested. There are also a few other things that I feel I owe larger posts, so look forward to that. It's been another busy political week in Massachusetts. What's on your minds? The Boston Herald is reporting that Jarrett Barrios is dropping out of the race to be Middlesex County District Attorney. Barrios will instead run for re-election to his state Senate seat. According to the article, Barrios' spokesman declined comment yesterday, so nothing official has yet been announced. The article sites Martha Coakley's unofficial endorsement of Barrios' rival for the DA post, Gerry Leone, as a "nearly insurmountable hurdle for Barrios." I have to say, though, that I disagree with the assessment that the Barrios campaign "stumbled" in recent weeks, particularly given how much hay the Senator was able to make over the passage of anti-gang legislation. That said, I've often wondered why Barrios wanted to jump to the DA's office when much of what he wanted to accomplish could be done from his seat at the chair of the Senate's Public Safety and Homeland Security committee. Leone would now be the only person left in a race that once fielded as many as four official candidates with several others who were considering jumping in. This also marks the second time a candidate has dropped out mere days after I wrote a long post about them. Under the Golden Dome had the scoop on this last night. [UPDATE]: The Boston Globe says that Barrios himself has denied this, but other sources say that he's seriously thinking about running for re-election instead. [UPDATE 2]: It's official. Here's Barrios' email to supporters as captured by a Blue Mass. Group poster. Gabrieli, expected to announce his candidacy on Thursday, is considering an early television blitz to boost his standing with party convention delegates so he can qualify for the primary ballot, advisers said. Gabrieli spent $5 million in a failed bid for Congress in 1998 and $7 million in his 2002 race for lieutenant governor. An early TV ad blitz will probably help Gabrieli's short-term poll numbers, but I have to wonder even about that. It's April. Do we really need to start seeing campaign ads for a September election now? Is he risking voter fatigue? Also, why is Deval Patrick's $5.9 million in mortgages worth mentioning again, but Christy Mihos' $4.5 million isn't? Is this double standard because Democrats aren't supposed to have money or is it something more sinister? [C]ritics of a bipartisan immigration bill passed by a Senate panel last week are choosing their words carefully, too - especially their flogging of the word "amnesty." Opponents of the bill insist it gives a get-out-of-jail free card to immigrants who have entered the country illegally. It's hard to argue with folks who consider the requirement that immigrants learn English, pay back taxes, work for six years, pay a fine and only then be allowed to apply for citizenship the equivalent of "amnesty," so we'll agree to disagree. Speaking of this issue, Fareed Zakaria was on the Daily Show with Jon Stewart last week and he made this point. Does the United States really want to follow the example of European immigration -- particularly the French -- with things like guest worker programs, deportation and the like? His argument was that this has not worked particularly well there, and there's little reason to emulate their solution here. Many European countries have a disaffected immigrant population that is, in his words, "ripe for radicalism and prone to terrorism." Both Zakaria and Stewart noted that given Europe's current problems it's hard to even think of another country that 'does' immigration better than the United States has done. It's hard for me to argue with that. On Friday, the Herald reporter/blogger Kevin Rothstein posted the results of a Zogby Interactive/WSJ poll that showed Deval Patrick winning over Kerry Healey by a larger margin than would attorney general Tom Reilly. Rothstein asked if this was the first time such a phenomenon was noted in the polls. This is not the case, because Zogby reported similar numbers in January. In any case, these poll results were then picked up by Blue Mass Group and other blogs. You can see them yourself, along with a number of other races at the Wall Street Journal website. Here are the results for the Massachusetts gubernatorial election, for what they're worth. In any event, every time I've put out the results of a Zogby Interactive poll, I've tried to do so with a disclaimer that the methodology behind these polls is suspect. Zogby has described the methodology in detail, but the short version is that the sample in these polls consists of people who fill out a form on Zogby's website saying that they're interested in taking polls. Zogby then randomly selects from that pool when conducting an opinion poll. In some cases for these WSJ polls, though not in Massachusetts, he supplemented this with more traditional phone calling. Zogby then crunches the raw data, weighting it by demographic factors, including gender, region, age and party. In Massachusetts weighting polls by party is particularly problematic since there are just so few registered Republicans in the state compared to all other parties. The result of all this is that these Zogby Interactive polls should not be compared with other, more traditional polling, since the methodology is so different. If, for example, Patrick polls closer to 43% in a poll released tomorrow, it's not because he lost ten points over the weekend, but it's just an artifact of the different ways those numbers are calculated. Note that Zogby International (also run by pollster John Zogby) does more traditional phone-based polling, and polls done under that name are usually more theoretically robust.